South Korea is seeking a sanctions waiver for its plan to survey the condition of a North Korean highway along the east coast as part of efforts to connect it across the border to the South, a unification ministry official said Tuesday. A sanctions exemption is required for the envisioned joint survey with the North of the Donghae Line highway because it involves bringing into the country equipment banned under UN Security Council sanctions resolutions. 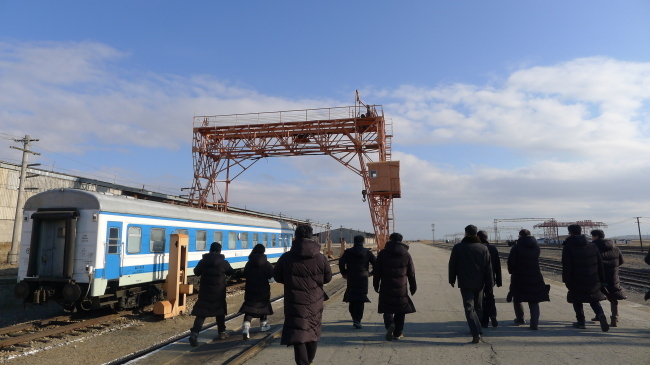 Last month, similar surveys were conducted for two railways and one highway in the North after the UN Security Council granted sanctions exemptions for them. "A sanctions exemption procedure is under way for the joint road survey," a ministry official said. The South has filed for a waiver with the Security Council after discussing the issue with the United States at a recent meeting of their joint working group on North Korea, sources said. Once a waiver is granted, the South plans to discuss with the North specific schedules of the survey. Modernizing two North Korean railways and two highways running along the rail lines, and linking them to the South is part of an agreement that South Korean President Moon Jae-in and North Korean leader Kim Jong-un made at their first summit in April last year.